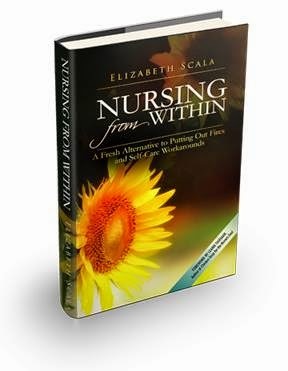 I had the distinct pleasure to read an advance copy of Nursing From Within by Elizabeth Scala this summer and I have to say it came at the right moment. We all experience lows in our nursing careers and Elizabeth hits the nail on the head when she guides you through the process of reaching within yourself to find that passion and learn to love nursing again. So once again I am honored to be part of the virtual book tour for this wonderful book. Every nurse should read it and it's a MUST for your professional library!! Nursing From Within will help you to love nursing again as it directs you to take care of your own body and soul so that you can continue to be there for your patients. Nursing is one of the most physically and emotionally exhausting professions and if we don't replenish ourselves we will not last very long. Nurses make a difference in someone's life everyday and in order to be able to be there we need to keep filling up our own fuel tank with love and compsssion for ourselves and our career. Elizabeth writes in a conversational style that it easy to read and retain the tips and information she gives you. And it's easy to pick it up again and again to refresh yourself when times get really stressful. Thank you Elizabeth for this insightful book! The healthcare industry is undergoing many changes now as we accept the challenges of the Affordable Care Act. Most notably right now, nurses are taking a lot of heat with this Ebola crisis and it's important to remember why we wanted to become nurses and to hold on to that passion and love even through the trying times. Nursing From Within will support us as we take this next leg of our journey through the life and career as nurses.